The suspected 25-year-old gunman went into the Coney Island building where his 17-year-old ex-girlfriend was and shot her in the chest, police sources said. Erica Byfield reports. A man shot and killed his 17-year-old ex-girlfriend inside her Brooklyn apartment building early Tuesday morning, and shot and wounded the girl's new boyfriend, police sources say. The suspected 25-year-old gunman went into the Coney Island building where his 17-year-old ex-girlfriend was and shot her in the chest, police sources said. He then shot her 20-year-old boyfriend before leaving. The girl, identified as Alyssa Rodriguez, was taken to Coney Island Hospital, where she was pronounced dead, police said. The man is in stable condition at Lutheran Hospital. Rodriguez's mother, Tracy Colon, disagrees with law enforcement sources' account of the shooting. She told News 4 that her daughter was shot while trying to break up a fight between her boyfriend and a man he knows, not an ex. "Why you gotta shoot, why you gotta shoot man?" sobbed Colon. "Look what happened to an innocent 17-year-old girl who hadn't even lived her life yet." Neighbor Victoria Lynch says she heard a gunshot just before 4 a.m. 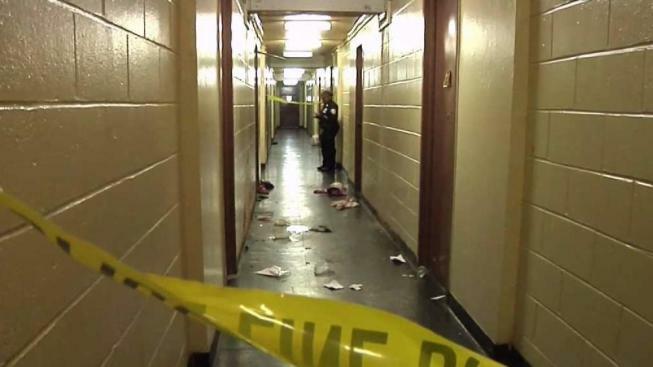 When she walked down her fourth-floor hallway hours later, she found a bloody scene: crime tape and heaps of clothing and shoes scattered on the floor. Another neighbor described a chaotic scene: "They were on here in the hallway, screaming, crying, carrying on. And I saw her die." An arrest has not yet been made. "It's so sad," said Lynch. "My condolences go out to all the families involved in this. It breaks my heart." Anyone with information on the whereabouts of the gunman should call Crime Stoppers at 1-800-577-TIPS.